This short publication describes the preludes to the conflict (2011-2012), the failed transitional period (2012-2014), the outbreak of the conflict (2015-2016) and the current situation (2017). It also provides an overview of the role and involvement of the various armed groups, as well as a mapping of foreign involvement in the Yemen conflict*. Although the conflict in Yemen is widely presented as being between two distinct blocs – a Houthi–Saleh alliance against forces loyal to the internationally recognized president of Yemen, Abdrabbo Mansour Hadi, backed by a Saudi-led coalition – this description can be misleading. The publication highlights that neither camp is cohesive as both feature armed groups or regional players with divergent ideologies and political goals. 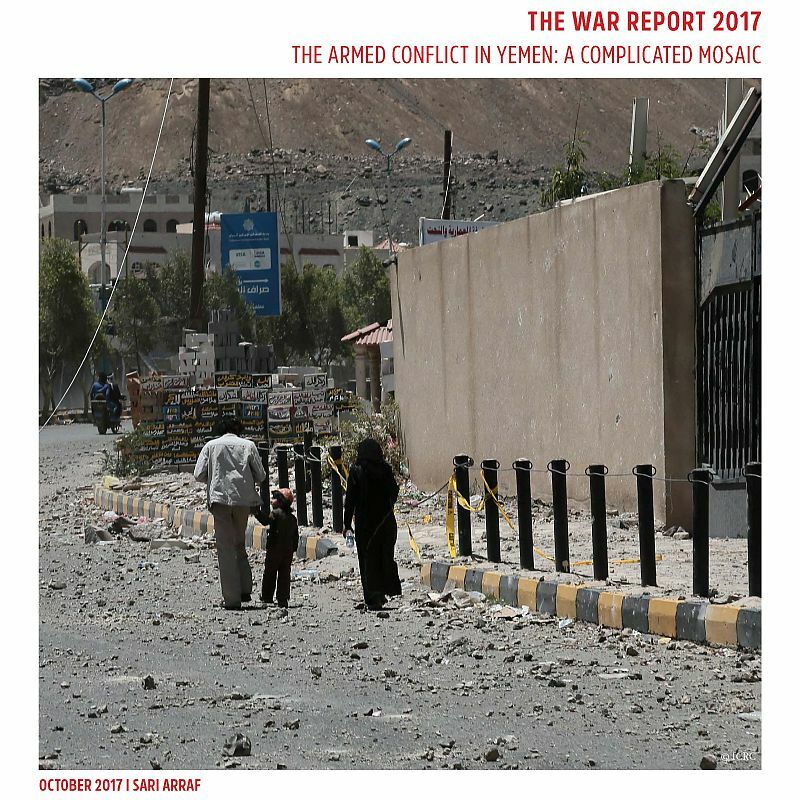 ‘From secessionists in the south, to Salafists in Taiz and Aden and tribal leaders in the north, there are smaller groups in Yemen who are not necessarily under the control of Hadi or the Houthi–Saleh alliance’ underlines Dr Annyssa Bellal, Strategic Adviser on International Humanitarian Law at the Geneva Academy and Editor of the War Report. ‘In addition, the presence of al-Qaeda and Islamic State (IS) in Yemen render the Yemen conflict mosaic more complicated’ she adds. Even states participating in the Saudi-led coalition seem to have different agendas in Yemen, as evidenced recently in mounting tensions between Hadi and the United Arab Emirates (UAE) over the latter’s alleged support for secessionist groups in South Yemen who operate quite independently from Hadi. Since the beginning of the Yemeni conflict in March 2015, at least 4,773 civilians have been killed and another 8,272 injured by the violence. Food insecurity has reached critical levels as 17 million people (around two-thirds of the population) are estimated to be severely food insecure, among whom 7 million are close to famine. The country witnessed a cholera outbreak in October 2016, which has since led to at least 1,740 deaths with a further 320,000 suspected cholera cases. Cholera flourished amidst a collapsing health care system and around 16 million people not having access to adequate water, sanitation or hygiene. The Rule of Law in Armed Conflicts (RULAC) online portal provides information on the classification of the armed conflicts that have been taking place in Yemen, identifies the parties to these conflicts, and the applicable law. *Foreign involvement does not necessarily means that these countries are parties to the conflict from a legal perspective. For further information about who is a party to an armed conflict, consult our Rule of Law in Armed Conflicts online portal.